Thirty glass spheres are attached to a wall and arranged in two horizontal rows. 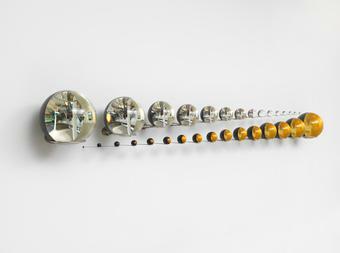 The spheres progress in size from that of a marble to that of a soccer ball, two of each size; one sphere of each size is placed in each row, with the row’s spheres ordered from smallest to largest. The upper row is arranged so that the largest sphere is at the viewer’s left, while the lower row has the largest sphere to the right. 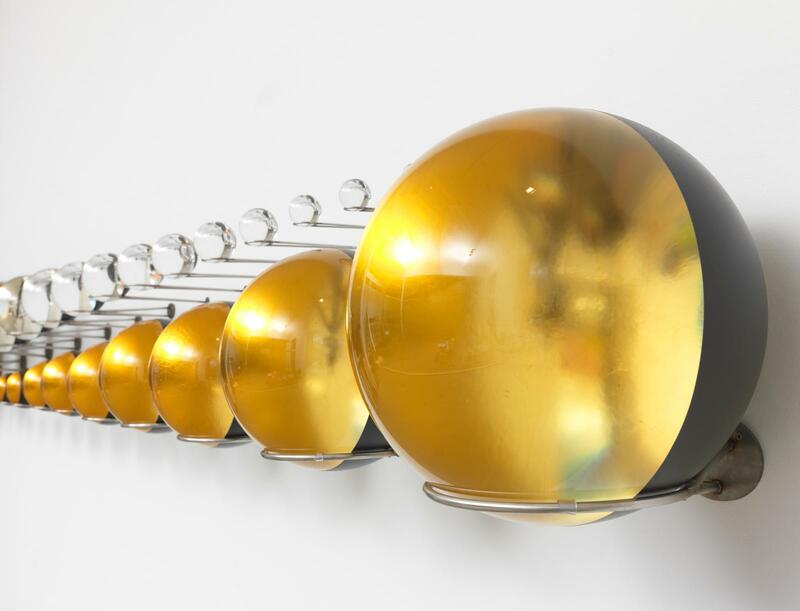 The spheres in the lower row have been gilded, and those in the upper row display a silver mirror finish, with black paint applied over the surfaces of the gold leaf and the silver finish. 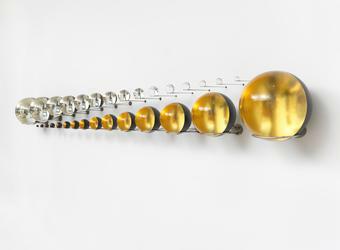 The spheres display various amounts of silver or gold finish. 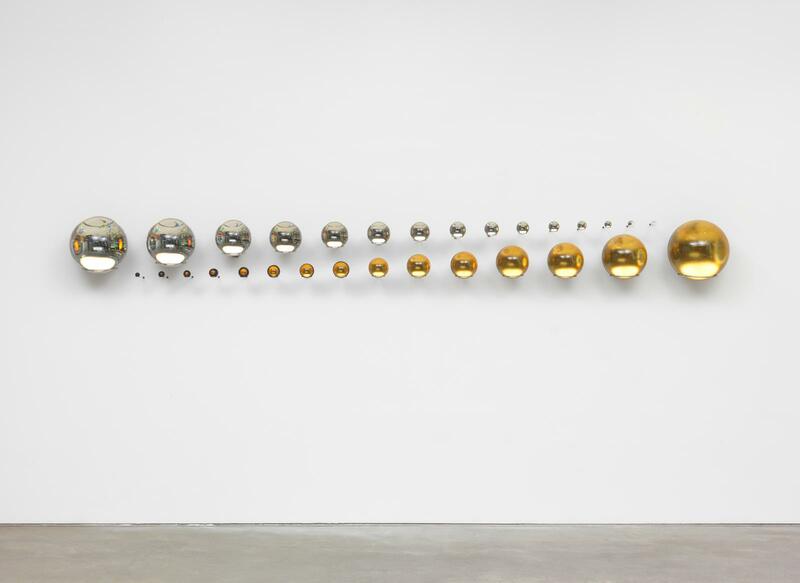 The smallest of the golden spheres is fully painted, but as the spheres in that row grow larger, the gold finish recedes until, at the largest sphere, the gold finish covers exactly half. 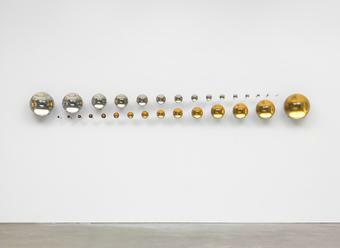 In the upper row, the largest sphere has a silver mirror finish covering its back half. 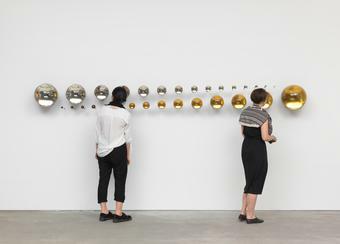 The mirroring recedes progressively as the spheres grow smaller, with the smallest sphere in the upper row fully transparent. Together, the spheres constitute an optical device in metamorphosis.